Every month we provide a detailed breakdown of the homes for sale in Tallahassee, and compare them to the current rate of demand. We publish our findings on our Tallahassee Housing Report section of our website, and we also offer a free one-page download that allows you to know the supply and demand for homes in each area and price range of the Tallahassee real estate market. But every so often, we like to dig a little deeper, hoping to find something useful, and today I think we have. 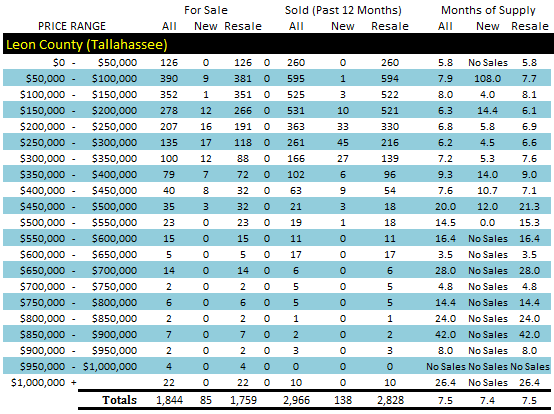 The following table shows a break-down of the homes for sale in Tallahassee by price range. As a reminder, we consider a price range in balance (at market equilibrium) when months of supply are at or very near "6." The current "line in the sand" appears to be around $300,000, as months of supply start to go up too high after that point. Remember, this table includes all areas in Leon County, but that does not mean that a $250,000 in one part of Tallahassee is as easily sale-able in all parts of Tallahassee. Supply and demand must be studied at the neighborhood level, so consider this information as a Tallahassee real estate market overview. We track the status of the homes for sale in Tallahassee each month to identify changing trends that homebuyers will encounter when they enter the market. This type of information is critical in knowing how to negotiate with sellers (if we know the seller's position in the market, then we can negotiate a better deal). Of course, the same is true for when we help a seller negotiate with a buyer. Regardless of your side of the transaction, knowledge of the other side's position gives you a leg up in the negotiation. 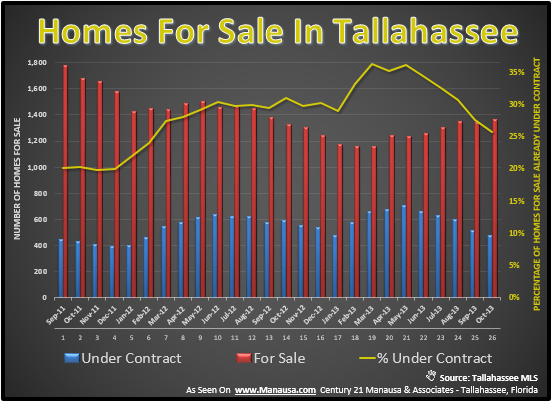 The real estate graph above shows that the number of homes under contract (blue and yellow area) is on the decline, while the number of homes for sale in Tallahassee that have no buyer contracts yet is on the rise (red bars). This means that buyers should be less frustrated today when inquiring on a property than they were at the beginning of the year, when they were often told "that one is already under contract." Our visitors tell us our new property search tool rocks! Why? Because they can have it remove all of the properties that are for sale but already under contract. Or they can look at just those that are under contract. Either way, it puts the control in your hands. Most real estate websites show you all of them lumped together and you have no idea which are under contract, and which are not. The graph above shows the number of available listings in red and those under contract in blue (measured on the left vertical axis), while the ratio of those under contract to all available listings is shown on the right vertical axis in yellow. The number under contract has fallen to just 1 in 4, which is the lowest recorded ratio since February 2012. 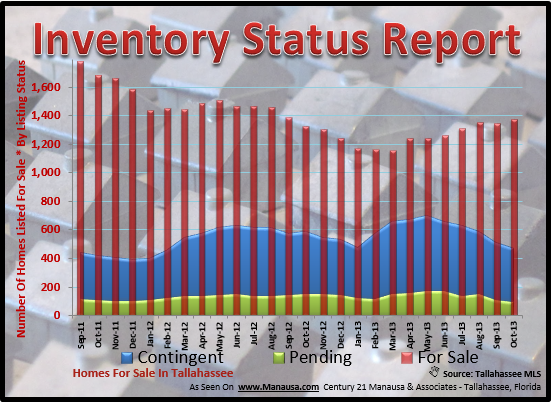 This is either an indication that home sales are slowing down, or that short sale closings are speeding up. We'll know the answer to this in the next 90 days, as we closely monitor the Tallahassee MLS for closed home sales reported. If you would like to know how to use this information about homes for sale in Tallahassee to your advantage during a real estate negotiation, just drop me a note and we can schedule at time to discuss your goals and plans and how our information can help.